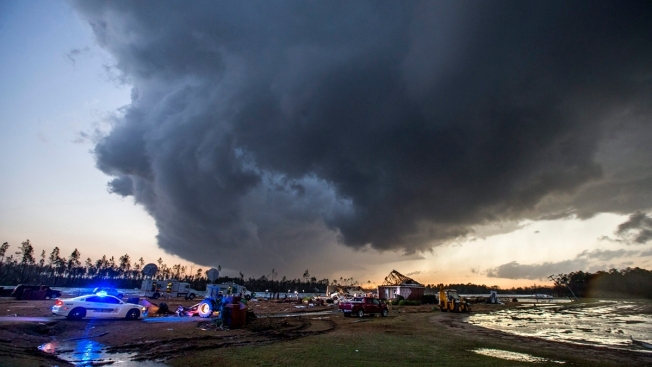 Storm clouds approach emergency crews at the scene of a house cut in half by a tornado near where seven people were killed outside Adel, Georgia USA on 22 January 2017. Emergency officials report that at least eleven people have been killed in Georgia during a severe weather outbreak in the southern United States. Do you have an interest in severe weather and tornadoes? With spring storm season right around the corner, now is the perfect time to learn all about the crazy weather we often see between March and June here in North Texas. There are still several opportunities to attend one of the Skywarn seminars hosted by the National Weather Service. These educational seminars provide valuable insight in how to become a storm spotter for the NWS, and they serve to satisfy the weather enthusiast in all of us. The basics of storm development are covered, along with an explanation of how tornadoes form. The folks from the National Weather Service do an excellent job explaining the science and always provide exciting pictures and video clips. Many of the sessions are divided into basic and advanced training. It’s always a lively bunch and a great learning environment. Questions are always welcome. Below are a few pictures from the Tarrant County Skywarn seminar in late January. NBC 5 sponsored this particular session at South Hills High School in Fort Worth. We had a great turn-out in the auditorium with a few hundred in attendance. If you're interested in attending one of these free seminars, there are still several sessions remaining in other counties. The Dallas and Denton county sessions are later this month and include advanced training.